Kyocera Corporation (President: Hideo Tanimoto) today introduced a new clamshell-style branch connector for automotive electronics that features a unique locking structure for waterproof connections, ensuring reliability in harsh conditions. The new Sheltap 9715 Series Waterproof Electronic Branch Connector will be shown for the first time at CEATEC JAPAN 2018 (Booth #H009), October 16-19. Samples are now available upon request. A branch connector is used to install electronic equipment, such as a navigation system or dashboard camera, by branching power from the vehicle's main wiring harness. Since Kyocera introduced its original 9215 series branch connectors in 1992, the products have been lauded for providing reliable connections while streamlining assembly and installation workflow through their unique clamshell structure. In 2014, Kyocera became an early developer of connectors for aluminum wiring to support weight-saving initiatives among automakers. Rapid adoption of advanced driver assistance systems (ADAS) and other automotive electronics has created new demand for connectors that can withstand harsh environments, including the vehicle exterior and direct exposure to the elements in all weather conditions. Kyocera designed the Sheltap branch connector series to provide a high level of waterproof functionality and reliability — successfully passing the high-pressure washing and high-temperature exposure testing of the JASO* D616 standards, which evaluate wire harness connectors with specially designed enclosures and sealant materials for automotive applications. Kyocera's Sheltap series connectors embody the company's commitment to supporting the rapid advancement of electronic technologies in diverse markets, including automotive, shipping, and outdoor security / camera-monitoring applications. By combining a unique housing lock structure with sealant materials, the new connectors are able to meet JASO D616 standards for high waterproofing and reliability in automotive components. The Sheltap series connectors can also operate in extreme temperatures from -40 to +85ºC (185ºF). The products are designed to meet the special interconnection requirements of aluminum wiring, which is 40 percent lighter than copper wire, and increasingly seen as a key to meeting vehicle weight-reduction goals. The new waterproof connectors are easy to assemble – simply insert the wires and apply pressure. The connector keeps wires in place for excellent workflow, instantly providing a reliable connection with a waterproof seal. Kyocera's Sheltap series of branch-style electronic connectors are engineered for automotive use. 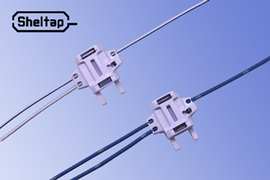 The clamshell design allows Sheltap connectors to branch and distribute electricity easily and with long-term reliability, even in harsh environments.